Broken furnace? Looking to schedule a furnace repair—and fast? 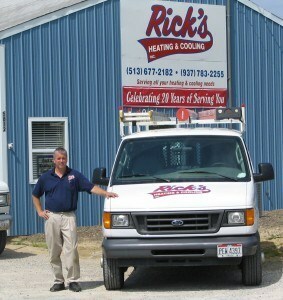 Call Rick’s Heating & Cooling. Our HVAC experts can diagnose and repair your heating unit with no problem! We are an affordable and reliable heating and cooling company that serves Warren County and the surrounding areas, including Amelia, Batavia, Fayetteville, Lebanon, Liberty Township, Loveland, Mason, Middletown, Monroe, West Chester, Wilmington, and more! Call us today at (513) 899-6005 if your furnace is acting up to schedule a heating repair! We also provide emergency repairs 24/7—call today! This tends to happen more toward the beginning of the heating season. If you’re not getting any heat from your furnace, first check to make sure the thermostat is set to HEAT mode and is at the right temperature (you wouldn’t believe how many times we’ve found that this is the only problem). If the thermostat is set where it needs to be, you may just have a tripped circuit breaker or a blown fuse, or your pilot light could be out. If your furnace isn’t creating heat, contact Rick’s Heating & Cooling for furnace repair! If your furnace produces some heat, but you don’t feel like it is enough for your home, check your filters and make sure they’re clean. If changing the filters doesn’t fix the problem, call Rick’s Heating & Cooling for furnace repair—your gas burners probably need to be adjusted. If your blower fan is running nonstop, make sure the fan setting on the thermostat is set to AUTO instead of ON. If it is, or if your thermostat doesn’t have a fan setting, call Rick’s Heating & Cooling to replace or repair your furnace’s fan limit control switch. If your furnace makes a lot of noise when it runs, it could mean the pilot needs to be adjusted or your furnace components need oil. Whatever the case may be, give us a call at (513) 899-6005 for furnace repair! If your furnace’s pilot light is burnt out, it needs to be relit! Simple as that. If you don’t know how to do this, or if you simply feel more comfortable having this taken care of by a professional, call the HVAC experts at Rick’s Heating & Cooling today! Our Morrow, OH based company can help find the professional solution for any of your furnace repair needs throughout the area, including Amelia, Batavia, Fayetteville, Lebanon, Liberty Township, Loveland, Mason, Middletown, Monroe, West Chester, Wilmington, and more! For more information on the furnace repair services we offer, give us a call at (513) 899-6005 or contact us online today!